A really decent saving of £90 for this 8-core 16-thread processor compared to the best current UK price. good price for this chip, i don't know how relevant this product is as the …good price for this chip, i don't know how relevant this product is as the 1700 ryzen is the same core/thread count and much cheaper. 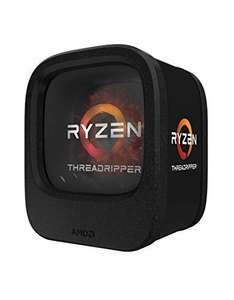 Unless of course you want to be on the threadripper platform then this may be a really good deal. good find. I believe one difference is quad channel vs dual channel RAM support? Also the 1900X has much higher base and turbo clock speeds. But in practice, you're right, many people will never notice the difference. good price for this chip, i don't know how relevant this product is as the 1700 ryzen is the same core/thread count and much cheaper. Unless of course you want to be on the threadripper platform then this may be a really good deal. good find. I believe one difference is quad channel vs dual channel RAM support? I think threadripper has more pcie lanes but i could be wrong as i hav'nt looked into this chipset much. Just a quick look at the AMD x399 boards, they look quad channel memory. Either way its a good price for the chip, just debatable whether it provides any real gains over the ryzen line up. I think threadripper has more pcie lanes but i could be wrong as i hav'nt …I think threadripper has more pcie lanes but i could be wrong as i hav'nt looked into this chipset much. Just a quick look at the AMD x399 boards, they look quad channel memory. Either way its a good price for the chip, just debatable whether it provides any real gains over the ryzen line up. I agree. But for those who know the difference and want TR regardless, this is a cheap way of buying it. I agree. But for those who know the difference and want TR regardless, …I agree. But for those who know the difference and want TR regardless, this is a cheap way of buying it. This has dropped so much in price, wow! Not that much. It isn’t the 1950X that was £1000. Ryzen loves faster memory. If Threadripper improves as much with better memory speeds. Quad might make quite a difference. Sheesh, well I was eyeing the 1900X up around the time of the release and was looking at an easy £650. gd chip price but the boards are still crazy prices shame really as it puts a little damper on threadripper as a whole, so often you hear "gd chip gd price but the boards are so expensive maybe I should just stick to ryzen". gd chip price but the boards are still crazy prices shame really as it …gd chip price but the boards are still crazy prices shame really as it puts a little damper on threadripper as a whole, so often you hear "gd chip gd price but the boards are so expensive maybe I should just stick to ryzen". It's the nature of the beast as they are more complicated with all those PCIe lanes and quad channel memory plus they sell in much smaller quantities so this is typical for a niche high end product.